An Australian runner who suffered life-threatening burns when she was trapped by a bushfire during a race has completed the Hawaii Ironman, seen as the world's toughest triathlon. 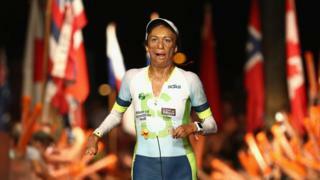 Turia Pitt received burns to 65% of her body and was told she would never compete again after the 2011 ultra-marathon in Western Australia. She has been hailed on social media as an "amazing role model". Ms Pitt completed a 3.8km swim, 180km bike ride and 42km run in a time of 14:37:30. The mining engineer, author and motivational speaker completed the event using custom-made gear and brake levers on her bike to accommodate the severe injuries to her hands. She also wore special race clothing to deal with the extreme heat and humidity. "Because of my burns, I can't regulate my own body temperature so I've had to make some adjustments, or use standard tri gear in different ways," she revealed last month. "I'm going to need things like cooling sleeves and white suits so I don't overheat." After her encounter with the bushfire Ms Pitt spent 864 days in hospital and underwent many operations to treat her injuries. She made her comeback in the Ironman Australia triathlon in May. "Competing in Ironman has ultimately showed me that I literally can do anything I put my mind to," she said on her blog. Ms Pitt was widely praised on social media as an inspiration. "Such a great example of what can be done through hard work belief in one's self and good a support system," one person wrote on her Facebook page. "You continue to amaze and inspire," said another.